How are you doing today? Summer’s in full swing, found any great new music for the summer? Personally, I’ve become kinda obsessed with Duett. Visions just has that wonderful, smooth, summer vibe to it. I just adore it. Now I’ve got their catalog on repeat. I’m working away on the new EP. I’ve got the music so close to done. Trying to focus in on all those pesky details now, like album art, cassette design, etc. But this Saturday I’ll be spending the whole day focusing on finishing off the music (ideally) and then I’l start dropping tidbits for your ears here and there. It’s gonna be a fun one! Speaking of, do you, or anyone you know, have any experience with GTA V and the Rockstar Editor? I’m trying to pull in a couple simple shots for a promo idea I have, but my computer isn’t quite fancy enough to make the game look as good as I know it can. I don’t know, shot in the dark. Let me know! Also, more details below, but tomorrow (Friday) I’ll be doing an AMA (Ask Me Anything) on Reddit! Now, on to the important part. Let me tell you about the wonderful Father’s Day present I got. But a few fans, Becca, Hannah, and Hannah (C and W, respectively,) on their drive down, while talking about Father’s Day (which was the day before) had a little idea. 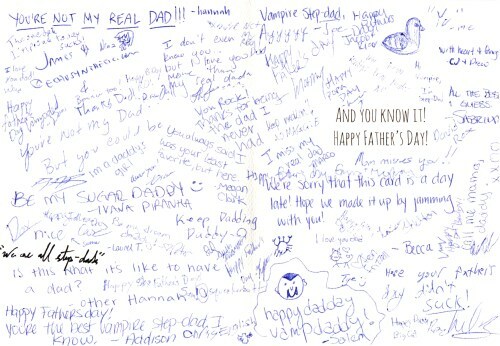 They stopped into a store and picked up a Father’s Day card, and while they waited outside in the line for the show, they asked everyone in the line to sign it. Now, I’m not naive. I fully realize that 99% of that line was for TWRP, not me. But really, that makes it even more special, that these kids, just there to see their favorite band, took a bit of their time, and write a nice note to the opener. That’s just wonderful. So I wanted to share with you all the wonderful things they said, even some of the creepy inappropriate things! I scanned it, and put it up on The Fridge. Check it out! Pretty cool, huh? I gotta tell you, that night was wonderful for a lot of reasons, but I can’t think of a better way to ending the night than reading over that just before I lay my tired head down in my casket. It was something mighty special. Huge thanks to Becca and Hannah, but not the other Hannah. They’ll just have to figure out which one I mean. And also, huge thanks to YOU for being part of the family, and supporting me in my creative efforts. Last thing: So tomorrow, I’ll be doing an AMA (Ask Me Anything) on Reddit, in the Outrun subreddit. If this all sounds confusing to you, just know that Reddit is essentially a web forum, and AMA means you can ask me questions and I’ll answer them. Of course, you can do that any time you want, but it’d be super helpful if you came and participated tomorrow, at 2pm EDT. (Use this link to help you find what that time is where you are http://www.thetimezoneconverter.com/) If you CAN’T make it, you can always leave your questions in the announcement thread, and a moderator will post them for you when the time comes. So, come by and ask me silly, serious, deep, shallow, embarrassing questions! I’ll answer them! I may lie, I may not, who knows!